I'm already behind, as well as falling short, on My Mission. Beau did get me the box for Day Three, and I did open it, but then it sat on the table in my Studio for the next Three Days. I'm still calling it day three though. I figure, it's my Mission and I'll call it whatever I want. 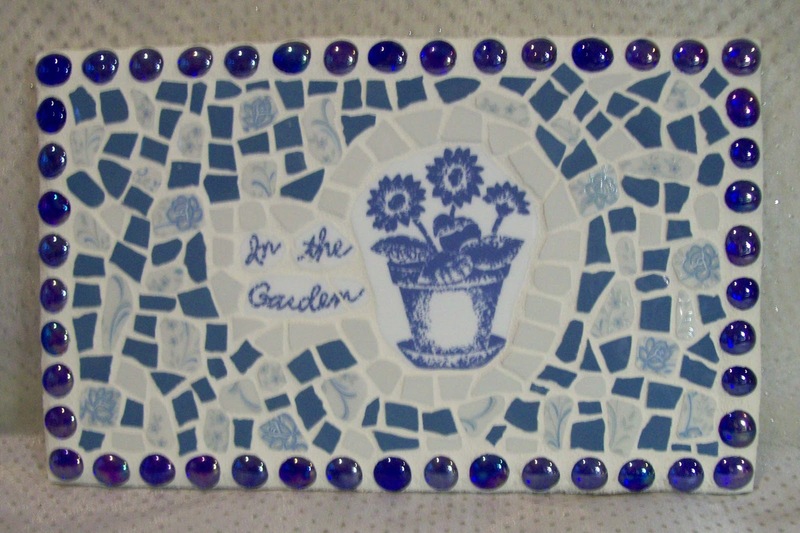 In the Garden, a mosaic wall plaque created (signed and dated on back) create December, 2001. And, although this one was also before the Art Diary, I do remember it clearly. I picked up 8 large Correll Dinner Plates at a yard sale (of course). 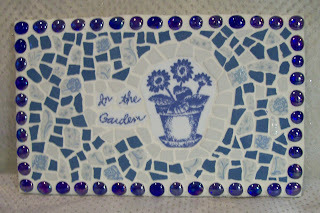 They were an off-white with the flowerpot motif and words, In The Garden, on each. You know Correll, those plates that are supposed to be really difficult to break. And yep, they are. I tried using my Nippers and, instead of breaking apart in chunks, they shatter into slivers of very thin glass. I went through all 8 plates to get one flowerpot and words set. At one point, I hit one of the plates with a hammer (ya ... I was getting agitated), and nothing; it didn't break. So, if you need really sturdy dinnerware; I highly recommend this brand. I never purchased this type of plate again. Anyway, back to 'In the Garden'. This piece is 13" wide by 8" high by 1" and weighs in at 2.10 pounds. Other than the Correll motif, it is created with plate glass, from saucers, I think and some of the Blue Roses China that was in the Day 1 Mission Vase. This style is called pique assiette, which means randomly places. 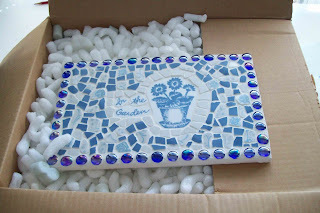 It is surrounded with dark blue glass gems and is on a piece of MDF, which makes it suitable only for indoor display. I'm going to put it my Shop for a few months, at a very reasonable price, and see if anyone is interested.